Bleach kills all kinds of organic pathogens, including mold spores and bacteria, each of which contributes to rot. Dilute the bleach 1 part to 10 parts of water inside a spray bottle. Apply to the surface, inside and out, to prolong the life of your pumpkin. If you want to be as thorough as possible, fill the sink with a bleach-water solution and soak the carved pumpkin overnight. After draining and drying, spray the pumpkin with a dilute solution daily. If you’re one of the rare families that has a member allergic to bleach, consider dealing with mold and bacteria by installing UV (ultraviolet) lights inside your HVAC system. These lights alter the DNA of organic matter, including mold, bacteria and viruses. After exposure, they won’t be able to reproduce, which eliminates them inside your home. Besides jack-o’lantern preservation, you won’t pass along as many germs or have a mold problem. If you have room, store the carved jack-o’lantern in the fridge, taking it out when you want to display it. As long as your basement isn’t overly humid or warm, the cooler temperatures will keep it fresh longer. A portable dehumidifier will lower excessive humidity levels in the basement, which prevents mold and mildew growth and the damage they do. If you don’t mind the smell, spray it with WD-40. It will coat the outside, preventing excessive drying or the formation of bacteria and mold. Let it dry 24 hours before putting a candle inside it. 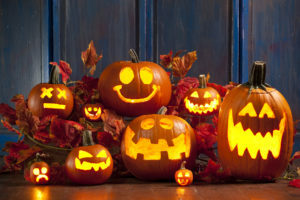 If you’d like to learn more about jack-o’lantern preservation and keeping your home free from bacteria, viruses and mold, contact Hartman Brothers Heating & Air Conditioning, providing HVAC services for Fort Wayne homeowners.